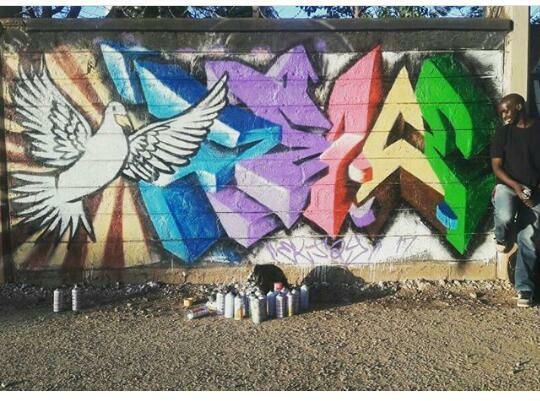 Graffiti art is changing the way Kenyans think and view the visual arts. It’s also changing the way they look at walls, be they walls outside Muthurwa Market, walls scattered all around Eastlands, from Jericho and Eastleigh to Kibera and Kariobangi, or even wall that individuals commission to have painted by graffiti artists in and outside their private homes. 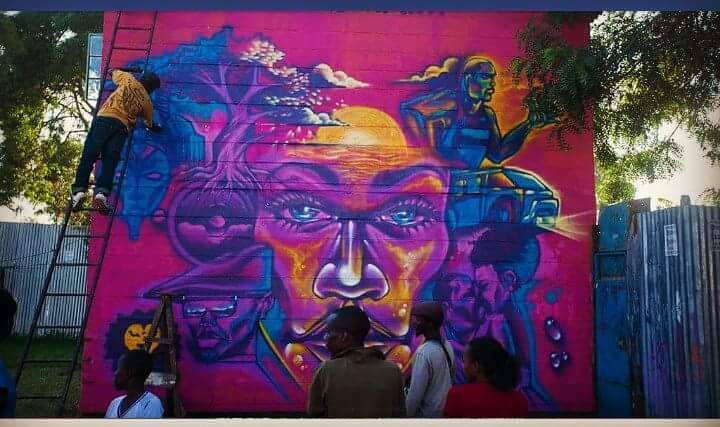 Perhaps the most notable event that confirms the arrival of graffiti art as the new visual aesthetic appreciated especially by a younger generation of Kenyans is the recent art exhibition at the Nairobi National Museum. But it wasn’t just that the exhibition by the popular trio team of graffiti artists best known as BSQ was given the entire Creativity Gallery to exhibit their artwork. It wasn’t even that the show seemed to suggest the art form most often equated in the West with vandalism and defacing of public or private property now had gained a sort of respectability in Kenya. What was more significant was the large audience of youth, most of whom had never been inside the National Museum before (except perhaps during a primary school bus tour), who appeared at the exhibition. The opening day of the show, the Museum curator, Lydia Galavu, had provided a huge sheet of hessian cloth to cover one section of the Gallery wall specifically for the youth to also try their hand at creating graffiti. And this they did in droves. Which is one reason why I am suggesting that graffiti art is offering Kenyan youth a whole new way of understanding visual art. Indeed, it’s apparently becoming the aesthetic they can most easily relate to. 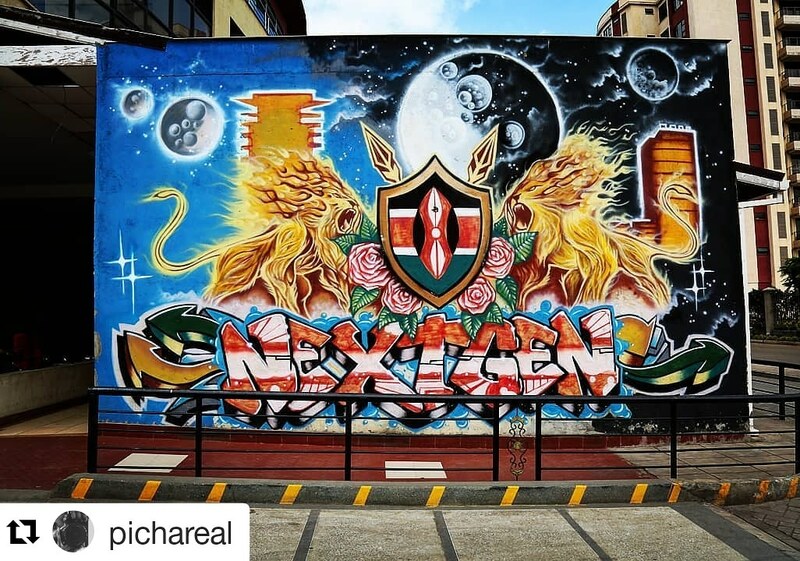 Another recent exhibition held in Nairobi also seems to reflect that same insight, that Kenyan youth who may not have felt any connection with the visual arts before (especially since the subject was removed from the national syllabus) now feel fully identified with graffiti. It was several months after the National Museum show, at the Alliance Francaise in the CBD. This exhibition sought to integrate reggae music, spoken word poetry and graffiti art in one show. The opening night was packed to overflowing with young people who clearly felt at ease with their senses being bombarded with bright colors, blaring rap music and rasta-men blending in as if they were an integral part of the sights and sounds. But these are not the first places where graffiti art has played a positive rather than transgressive role on the Nairobi youth scene. In fact, it was the British Council in the first years of the new Millennium who invited Kenyan youth to come to their car park and paint preferably in a graffiti style. The event was called WAPI! And it didn’t last that long but it was long enough to initiate any number of young aspiring artists into the scene where painting walls with powerful colors and creative ideas was not just acceptable but highly encouraged. Among the young artists who came out of WAPI! were mostly guys. The few girls who had made their way there didn’t follow up apparently. It would take several years before we would see young Kenyan women like Joan Otieno, Chela, and Sebawali Sio come on the scene and allow themselves to be known as not only graffiti artists but artists who worked in recyclable and ‘junk’ art. As for the young men who made friends during WAPI! were guys who quickly got nick-names. There was Bank Slave, Swift, Uhuru B, Smokey and many more. The four of them started creating graffiti art right away. They seemed to spray-paint everywhere they could find a wall or slab of cement that hadn’t been branded by Safaricom or Fresha milk or Omo soap. They were also quite irreverent given that there were some churches whose walls got spray painted as well. The venue that took up the slack once the British Council closed WAPI! was The GoDown Art Centre. Like the BC, they encouraged graffiti artists to get to work, but not just to paint any abstract idea or design, but rather to paint iconic figures from African and African American history and culture. That is how Lupita Nyong’o got to be painted by Bank Slave on the front entrance of The GoDown. It is also how Miriam Makeba, Michael Jackson, Barack Obama and many other icons got there as well. The GoDown also had a hand in organizing one of the first Graffiti workshops held at the Kenya Cultural Centre and run by Uhuru ‘B’ Brown. And like the graffiti that continues to cover the walls at the GoDown, the paint that was sprayed on the wall separating KCC (formerly owned by the British Council) from the University of Nairobi is still there. Since then, one of the most revolutionary graffiti murals to be painted in Nairobi was on Mwindi Mbingu Street in the dead of night by four graffiti artists who were advised at the time not to let their identities be known. Their advisor was the activist Boniface Mwangi who was probably right in believing that the foursome could get in serious trouble for spray-painting their intended imagery in so strategic a location as the entire wall situated right next door to Nairobi City Market and kitty-corner from the popular Tusky’s Chap Chap grocery store. The times were ripe for political unrest since it was a few months before the 2013 General Election for President of Kenya. The country had not yet recovered from the Post-Election Violence of 2007-2008 so the artists’ plan to paint a Vulture version of corruption in Kenya could have destabilized the country (it was feared) more than it was already feeling. So Bank Slave, Swift, Smokey and Uhuru B agreed to remain anonymous, even when the international media came to film and photograph the event as well as the aftermath of the graffiti mural-making. Mwangi had agreed to be the Fall Guy, but nobody seem to know that he’d also be the one to claim all the credit for creating the graffiti. None of the artists have subsequently complained publicly that they were overlooked or neglected for their creative genius. Nor was much made about the fact that neither the Kenya government nor the politicians made a stink about the mural. They all seemed to ignore it and several months later, the Asian owner of that wall painted over the mural and constructed a new building just there. So only the photos, films, international news stories and memories remain of that historic graffiti mural. But graffiti art, which is sometimes known as Street Art, continues to flourish. Virtually all those graffiti artists have had opportunities to travel abroad and attend workshops and artist residencies elsewhere in the world. Many have become globetrotters since graffiti is indeed an international phenomenon. 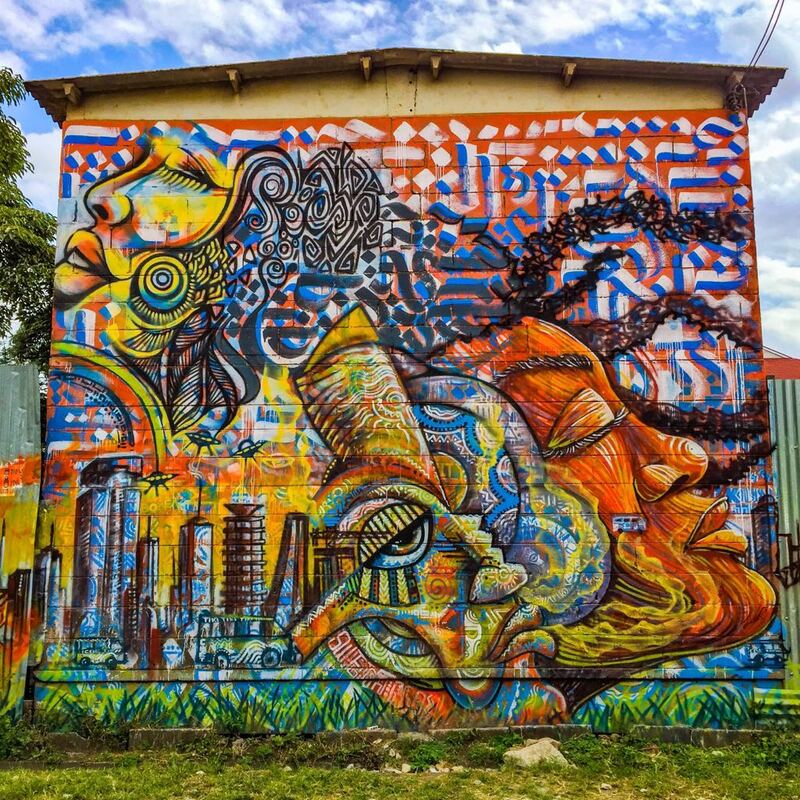 So much so that a team of German artists came to Kenya several years back and conducted a graffiti workshop with local artists even as they spray-painted interiors of the Village Market with graffiti art which is still there. One venue where graffiti art has been warmly welcomed in recent times is Uhuru Garden. It’s specifically where the NGO, The Trust for Indigenous Culture and Health (TICAH), has carved out a niche called Dream Kona and invited graffiti artists and aspiring ones to come and paint all day on the 8 foot tall wall specifically built for such occasions. BSQ have been the most consistent graffiti artists on that scene, and their emblematic style is visible in every edition of the mural-making that TICAH regularly conducts. “BSQ stands for Bomb Squad,” says Brian Masale (Msale), one of the three members of BSQ. The other two are Bebuto Thufu and Kaymist (Ken Otieno). The three artists had met at Dust Depo Studio which was established by Patrick Mukabi, one of Kenya’s leading mentors of young aspiring visual artists. It was Patrick in fact who organized the first and second edition of ‘Nairobi Street Diaries’ which were spray-painted along the very long wall of the Railway Museum. The one great misfortune about graffiti art is that it may never be recognized at world-class art specifically because it usually follows the same fate as the Vulture mural that briefly occupied the minds and hearts of many Kenyans. But whether graffiti art is short-lived or indelible like the murals and portraits painted at the GoDown, it’s unlikely that graffiti is soon going to lose its appeal to young Kenyans. 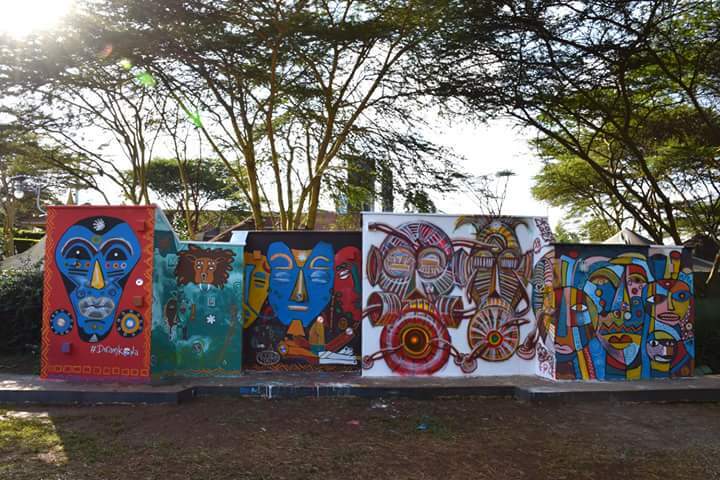 What’s more, graffiti is likely to continue bringing Kenyans around to a greater appreciation of the visual arts and the beauty and artistic expression that they have the capacity to create themselves.